Cords contained? Yes, it is possible. 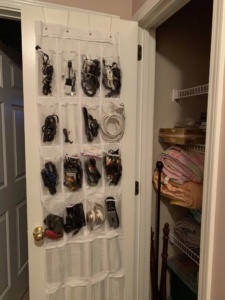 Two containers full of loose cords were neatly, and quickly, wrapped and placed in an inexpensive over-the-door shoe holder. I have tips on wrapping cords, too. Check out this post! Sort the cords and miscellaneous electronic accessories, throwing away what you do not need. If you haven’t used it in years, you probably want. 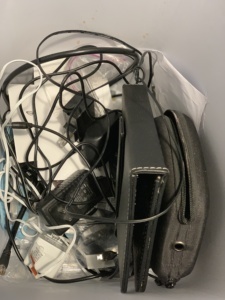 I threw away cords that went to devices I no longer have. Place the shoe rack inside a closet or on the back of door where it is out of the way. I placed mine inside of my linen hall closet. Since we do not need to access these cords often, out of sight and out of the way is what works best for me. 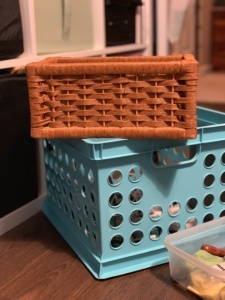 Who knew a $4.88 Walmart shoe rack could give such peace? Clutter is gone! If this brings value to you and your audience, simply share!